After hearing about these two canyons from Ian Parnell and Albert Leichtfried, we thought we really better investigate them on our return in 2017. Our conclusion - if you come to this area to climb, you have to go here! So much so, they deserve separating from the rest of Kåfjord and now get their own page. There are two canyons or gorges - Ørnedalen and Sabetjohka canyon. Ørnedalen is the largest canyon in northern Europe and runs southwest from the main valley. 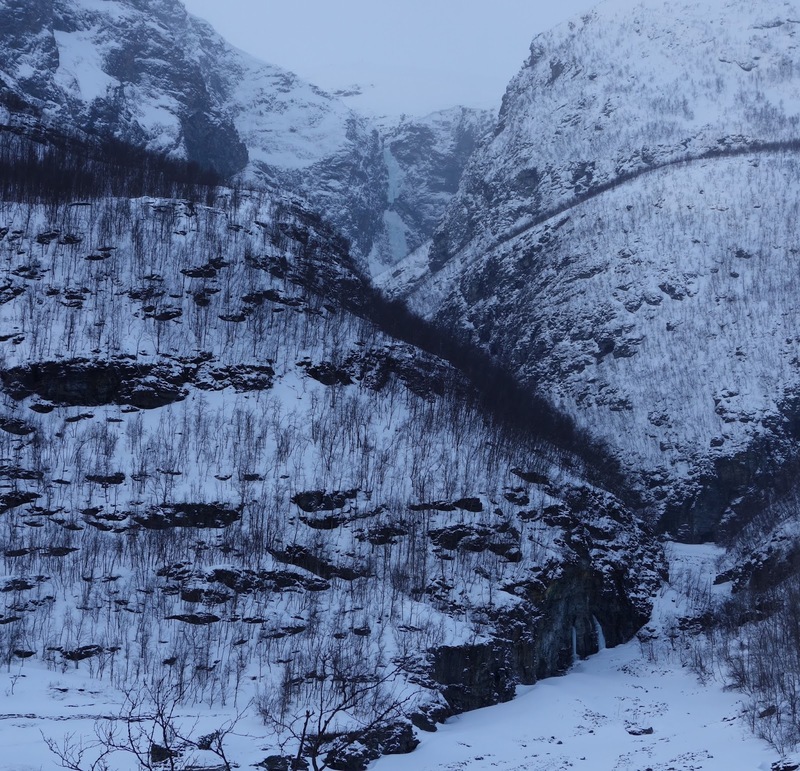 Sabetjohka (no less impressive) is a continuation of the main Kåfjordalen river and is home to the Gorsabrua suspension bridge and bungee jump that are indicated on some maps and signposts. The blue dots below give a very rough indication of where the climbing is. The main point about these areas is that you should really take a look at the pictures below to give you a rough idea of what you might find and then head on in there (early in your trip as you will probably want to go back!) - you can't get lost, just keep following the canyon. Both walks are in the region of two to three hours. Approach: we parked on the east side of the valley and crossed the main river where there is some tourist info at Ankerlia (old mines), then just follow paths into the canyon. The above photo from 2013 shows the main prize of a 200m WI6 on the left - this is the head of the canyon and is the same as in the picture below, taken from outside the canyon (different year, 2017). The routes on the right side above are, maybe, three long multipitches at WI5ish. Before you get that high, there are other routes - the largest being another long route at approx WI5 on the right side. Before that again, there looks to be an atmospheric two pitch route in a tight gulley. Remember, 2017 was a lean year so there could well be more ice most years. For scale, and it only shows the bottom quarter! Approach: park on the east or west approach roads and head straight up the valley, passing the mouth of Ørndalen canyon on your right. If approaching from the east road, head down toward the river about where the tourist info is. (You can keep on the road and carry straight on, onto a path that leaves the road the first switch-back but this includes some unnecessary ascent.) Note - the bridge shown on the map above in the canyon to the left, on the road after the switch-backs is NOT the bungee jumping bridge and just crosses a side valley. The photos below run roughly in order heading up the gorge, now running broadly south. There are routes from WI3 - WI7 (potentially, depending on conditions). 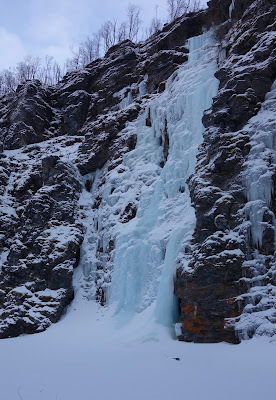 We only got so far up the gorge, to a narrowing where the river wasn't frozen - beyond there, there is the mighty Storfossen which is next to the bungee bridge, and maybe more. Storfossen WI7 has such a volume of water it may not come into condition very readily. 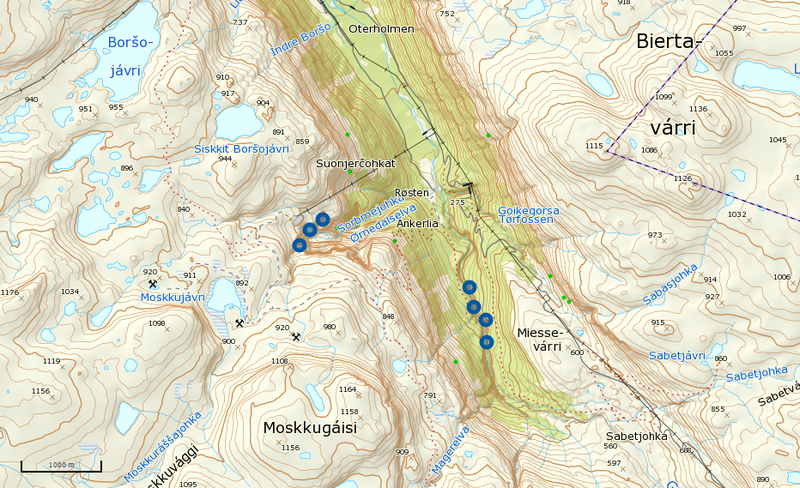 Beyond these climbs is Storfossen. Photos here (taken in summer) give an indication of the size of the falls. See here for Albert Leichtfried's account of his ascent: http://www.planetmountain.com/english/News/shownews1.lasso?l=2&keyid=37297#. 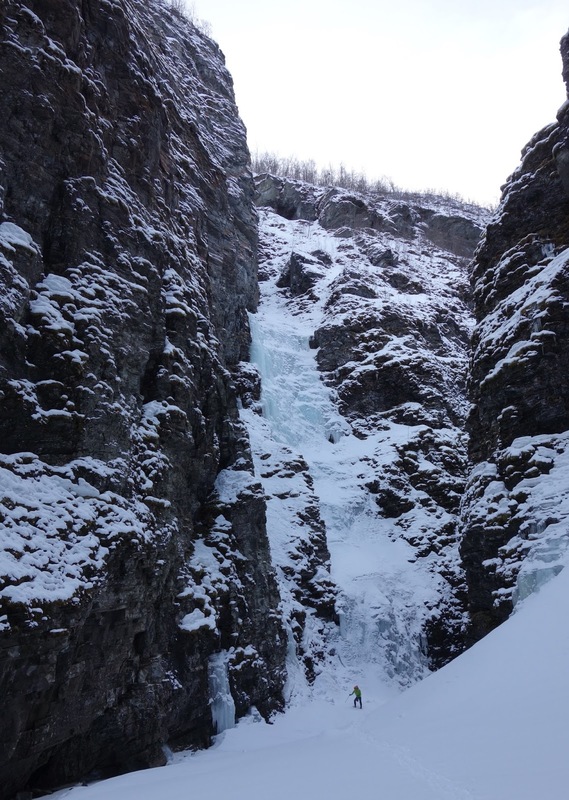 There are perhaps 10 falls from 40-120m in the main gorge formed by the Guolasjokka river - I think this is called the Sabitjakka Gorge but might be wrong. We climbed a nice 50m V+ there. We also returned to the Ørndalen Gorge which had been visited by Kurt Astner in 2011 (report on BD website) this is called the deepest gorge in Northern Norway on the toursit sign and branches off rightwards i.e South west. This has about 5 or so big falls not sure of grade spread Astner climbed a V, a V+ and VI, we climbed an unformed version of his VI, at perhaps a notch harder. I saw several big rambling adventurous looking things that looked in the IV+-V range. 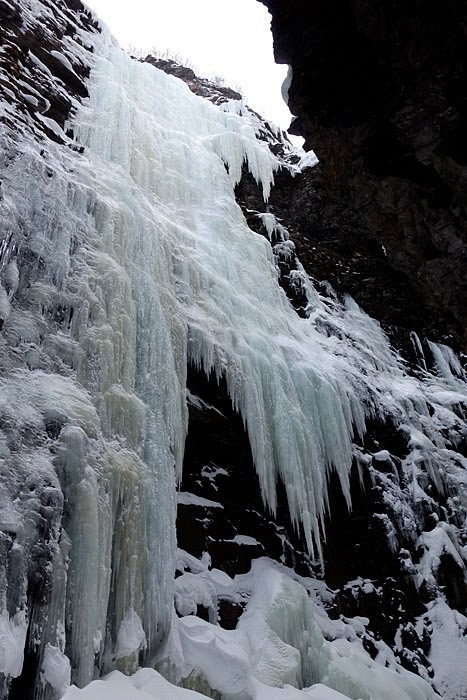 Ørndalen means 'the eagle valley' in Norwegian; Ørn is Eagle and Dalen means 'the valley'. Gorsabrua means 'the bridge of Gorsa' in Norwegian, brua means 'the bridge' and it's the name of the suspension footbridge at the top, it's not the name of the canyon. This is useful information. Thank you.